Note: the following is a commentary on the Reflections on Islamic Studies series, which appeared on the Bulletin blog earlier this year. My department has gained attention on campus for giving out buttons. 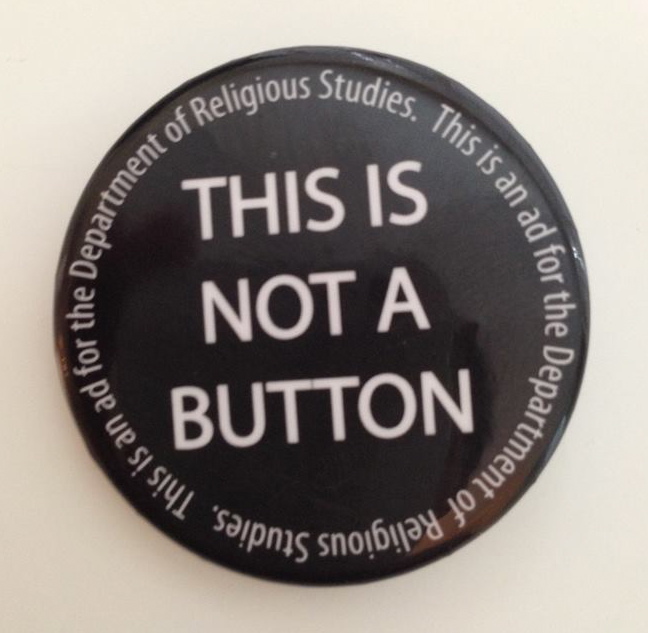 A recent example boldly read “This is not a button” in the center, with fine print around the edge that said “This is an ad for the Department of Religious Studies.” These buttons were a hit, prompting responses from an enlightened “oh” to laughter. Besides serving as advertising, we wanted these buttons to help students begin critically thinking about the role of swag on campus and our departmental decision to advertise. I would like this blog post on Islamic studies to function like the text on the edge of our buttons. I want us to pause to consider how the conditions of academia (a need to build a career, a rise in adjunct faculty, disappearing tenure track lines, elimination of departments, the cost of academic publishing etc.) might shape debates, the sides we take, and the time that we take on those debates within Islamic Studies. How do conditions influence how we attempt to argue and whom we attempt to discredit? How do we help construct or shape them through our own choices? In his post, Edward Curtis explained that “so many different people and institutions with so many different goals . . . have something at stake” in constructing and policing the category Islam. We, as scholars, are just as interested as any other group in defining Islam. In constructing our field, we have something at stake – livelihoods, sense of self, academic reputation. In our competition for resources – funds, citations, student credit hours, tenure, additional faculty lines, etc. – as well as our desire/need to build a career, we make choices that perpetuate issues of urgency and discourses about the exceptional nature of Islamic studies. We are not only responding to political situations or inheriting definitions of Muslims. Instead, we are also actively engaging in our power as scholars, who have institutions that legitimize our claims and access to venues and audiences for our ideas. To help us shape, work within, and utilize the theoretical tools of our field, the discipline of religious studies, and academia, we must examine these conditions and choices. In this series of blogs, scholars are explicitly and implicitly making arguments about the relevancy of our field. We argue that our field is important, in part because we believe it provides helpful ways of understanding, but also to build a career and to claim its worthiness for resources. Within the field of religious studies, studies of Islam are no longer justified by arguments that religion is necessarily sui generis. Instead, some scholars argue that Islamic studies is unique, because it is a discipline within the humanities. They argue that studies of humanity require special care, because people cannot be reduced to mere data. This argument can be found in other areas of study and is likely shaped by the rise in rhetoric that challenges the relevance of the humanities, but it also opens the humanities to ahistoricism and obscures scholars’ assumptions. Some argue that Islamic studies is distinctly political. All scholarship is political, and all scholarship will be used for normative ends (sometimes regardless of the intent of the scholar). However, labeling scholarship as political or normative does open work to particular markets and audiences. Competition over resources can influence the style, as well as the type, of arguments that we make. Theories that undermine claims about the exceptional nature of a field are often vigorously attacked. In religious studies, theories (like that of social constructionism) are often robustly debated, in part because they are seen as undermining the relevancy or necessity of religious studies as a field. Our embrace of new media, such as blogs, also shapes our field. We seek out various areas of teaching, writing, and speaking in order to influence people and their ideas, gain recognition, and create demands for our work. Many scholars are using blogs to address issues within academia. Some attempt to use it to bring their research to the public sphere – responding quickly to current events or publishing in a format that is affordable for those without access to a university library. Some use it as a way to publish ideas without the politics sometimes involved in academic publishing or as a way to get feedback more quickly. These are all ways to build an audience, a scholarly reputation, and hopefully a career. Yet blogging has problems as well. It may reinforce issues of power and access within academia. Blogging requires access to technology and space on the internet. Scholars with academic affiliations often have these resources provided. Senior scholars are often the ones invited to write for more prominent blogs, and their posts are frequently circulated more widely. Junior scholars and graduate students may have less time to blog, because they need to worry about the weight of various types of publications. As a result, blogging can end up magnifying the more powerful voices in academia. The format of blogging allows scholars to analyze current events, but it also contributes to a sense of urgency (which Ruth Mas highlighted as a problem in post 9/11 scholarship) in our work. The format of blogs is different than articles or books. They are usually short, only allowing for the introduction of an idea or two and hardly allowing space for citations. Without citations, posts can become confusing or completely inaccessible to those outside of a specific discipline or area of study. If reality television has taught us anything, it is that it becomes very difficult to follow onscreen fights about events that happen off-screen. With these limitations or problems in the format, blogs run the risk of becoming the new forum for sound bites on Islam – intentionally or unintentionally presenting certain interpretations of the Islamic tradition as authoritative. Without considering our choices as scholars (about the medium and message of our work) and reflecting on the conditions of our work, we can end up reifying Islam or reproducing dualities of “good” and “bad” Muslims. We may magnify the voices of “good” Muslims or, equally problematic, what we present as the right interpretation of Islam. These practices limit the debates that we can have within Islamic studies, bringing identity politics to the forefront and retreading debates concerning normative versus descriptive or critical versus caretaking work. Eleanor Finnegan is an Assistant Professor of Religious Studies at The University of Alabama. She is working on a monograph, focusing on the formation of identities and communities on American Muslim farms, that challenging assumptions about the construction of the categories of Islam, American, and environmentalism, as well as the role of worldviews in shaping environmental action. This entry was posted in Uncategorized and tagged Edward Curtis, Eleanor Finnegan, Islamic Studies series, Ruth Mas, Social Constructionism. Bookmark the permalink.